The annual National Youth Council (NYC) Singapore Youth Award (SYA) made its debut in 1975 to award young distinctive, passionate and exemplary Singaporeans who inspire others through achievements and services to the community. As quoted by the Chairman for the SYA panel and advisory committee, Mr Tan Yam Pin, the spirit of the SYA is the “excellence within the heart”. The award ceremony started promptly, but I was pretty surprised that the guest of honour, Prime Minister Mr Lee Hsien Loong, was not scheduled to speak at all. Every year, the Medal of Commendation is presented to past SYA recipients who have continually shown the spirit of personal excellence and community involvement. This year, the Medal of Commendation was awarded to two outstanding individuals in Dr Kong Kwai Loong and Mr Sheik Alau'ddin Yacoob Marican. Thereafter, PM Lee and Dr Vivian Balakrishnan (left image)) were invited to launch “Different”, an inspirational book that celebrates the success, achievements and even failures of past 30 years’ SYA winners. “Different” features their experiences and stories behind their success. 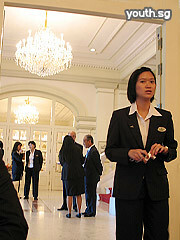 After the award ceremony, all guests were ushered to the Banquet Hall (image, bottom right) for refreshments (catered by The Regent Singapore). I must say that the Laksa was excellent. Even comparable to the all-famous Katong Laksa! So fragrant! ... But I digress. After PM Lee's brief conversations with the award winners, Youth.SG managed to speak with Boon Teck, Glenn Lim, Dr Ng and Theresa Goh. Despited being interviewed separately, all four recipients shared one common difficulty; the lack of time. To Glenn, 24 hours were never enough for a day. “Time and life waits for nobody but ... going the extra mile, handholding troubled teenagers, late night counseling sessions” and the eventual witness to something fruitful makes it all worthwhile. 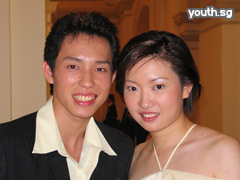 Similarly, personal time for family and friends has always been sacrificed in Theresa Goh's life (image, left). She has to give up spending time with loved ones because of the long hours spent training in the pool in a bid to work towards her first Para-Olympic medal. Despite her sacrifice, Theresa believes that we should “treasure the people around (us) because their support matters the most”. ... a “recognition that prove worthiness” (quote courtesy of Dr Ng) in one’s doings; and like how petroleum fuels the engine, the SYA fuels the passion to achieve even greater heights. Perhaps the collective attitude of the NYA winners was best summed up by Dr Ng, who said “nobody works for awards”.